The main opposition Liberty Korea Party elected four-term lawmaker Rep. Na Kyung-won as its new floor leader Tuesday, amid escalating internal strife ahead of a leadership election next year. In the general meeting held at the National Assembly, Rep. Na decisively beat three-term lawmaker Rep. Kim Hack-yong, garnering 68 votes to 35. Among the 112 party lawmakers, 103 could vote, as memberships of nine lawmakers are currently suspended. Rep. Na is the first female floor leader to be elected at the conservative party. Two-term lawmaker Jeong Yong-ki, who partnered with Rep. Na, was elected as the party’s chief policymaker. The new floor leader is tasked with strengthening the party, which is struggling to gain a foothold as the biggest conservative party and mend factional division among its lawmakers. “I believe you choose the future (by voting for me). I believe you choose to unite, and not divide. The wearisome talk about factional disputes in our party should really be discarded, and now we should move together,” Rep. Na said during her acceptance speech. Denouncing the liberal Moon Jae-in administration, Rep. Na vowed to unite her conservative party and to keep it in check. “Some of you may be scared of the Moon administration’s rampage, of its speed in destroying the values of the Constitution, and its attempt to turn the tides,” she said. The Liberty Korea Party has been riddled with factional feuds between those deemed to support former conservative President Park Geun-hye and those opposing her. Park was ousted in March 2017 and is standing trial for a series of corruption charges. Rep. Na succeed third-term lawmaker Rep. Kim Sung-tae, whose one-year term ended Tuesday. The judge-turned-lawmaker is a big-name politician, who claims to have no factional ties, especially to Park. 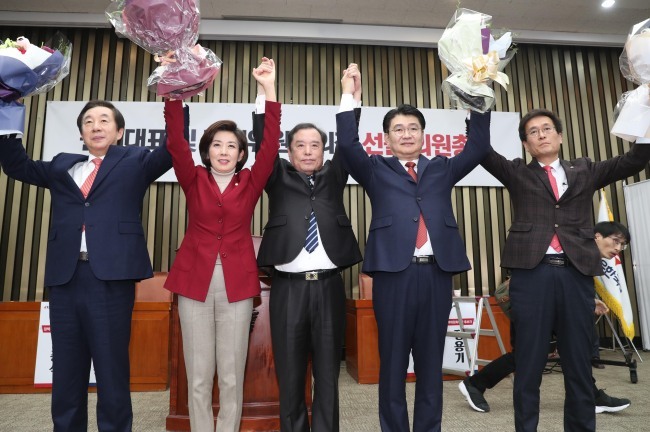 Pro-Park lawmakers, however, are said to have supported Na in the floor leader race.